Nadia Kassem is momentarily taken aback when she realizes our interview will contain a short filmed segment. She has just come from one of her final, intense training sessions for her upcoming bout against 2-0 TUF alumni Montana De La Rosa. It certainly hasn’t been all the glam for her opponents, as the undefeated Aussie’s highlight reel contains more than a few brutal KOs. After a promising victory over Alex Chambers in her UFC debut, she was immediately a force to be reckoned with before a string of freak accidents outside the Octagon (to her back and to her hand) sidelined the Aussie for well over a year. In her time away, she made the move to flyweight and counted the days until she could get back to her finish-heavy form. We caught up with her just ahead of her UFC 234 return. UFC: Been too long since we've seen you. I guess the obvious question is how are you feeling? NK: I’m doing great. The layoff I had was good and bad, but of course mostly good, that’s why I’m here. It gave me plenty of time to reevaluate my strategy with fighting and the weight class, as well. That’s why I’ve decided to come back at flyweight. I’m stronger than ever at the moment. UFC: Is there a big difference in what do you had to do in training to fight at flyweight vs strawweight? NK: Physically, yes. I’ve been doing more types of endurance training. Not just cardio, but for the muscles. Flyweight is a bigger division, so I actually had to do weights and bulk up and then shred down. But this time around, shredding down to the weight was a lot easier, and a bit more enjoyable, too. UFC: So you feel more comfortable at 125? NK: Definitely. I’ve fought at flyweight before, but now I know it’s the size for me. I’ve made strawweight before, and I thought “no worries, I’ll come back bigger,” but in the long run, to be a strawweight, it was obviously not a good idea. I also don’t want to jeopardize my body for the future. One day I want to have kids, and that might not have been an option if I had stayed at strawweight. UFC: And with the injury, obviously you're a pro and you know your body is going to heal up. But how do you mentally get through something like that? UFC: How long was it before you could get back in there and do light work? NK: When I hurt my back in the middle of the year, it took awhile. I could only do some boxing and things like that after a month. But in terms of my hand injury—I hurt my hand in August---I couldn’t punch anything because I tore my tendons all the way down my forearm. It took a massive toll on me. I was in a cast. I was carless at that time too, so a lot of things had fallen in one go, so I was going through another downfall when I thought I was just getting back on my feet. But I’ve just realized: if you fall down seven [times], you stand up eight. I’m just trying to be resilient and always get back up. UFC: Obviously, you always want to win. But does the layoff increase your desire to take care of business of Sunday? NK: It does. It does. It makes me a lot hungrier to come back for it, because it’s ben such a long time, and I was itching the whole time to fight, you know? Even when I was injured, I was coaching and doing the training and fitness things so I was still ready to go, one way or another. 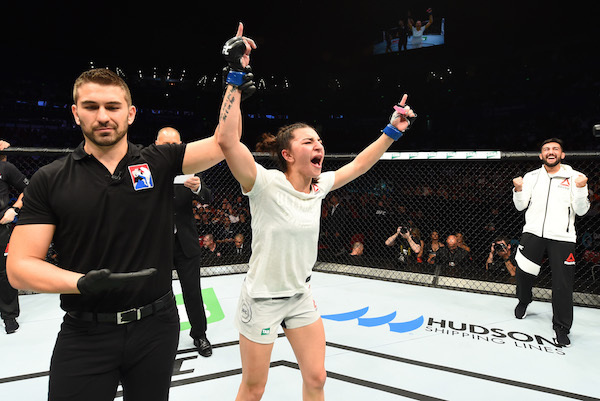 UFC: If everything goes your way Sunday and you stay healthy, are you looking to make up for lost time in 2019? NK: Definitely! God-willing this Sunday I get the win. If I do, of course I want to fight more often. As long as I come out healthy, I want to be fighting again. I want to get another two fights this year. UFC: You’ve mentioned wanting to do more than merely win. NK: Of course! I don’t want to just win. I want to win with style. No one remembers the boring fights, you know? That’s why I love to fight people who are entertaining, so that we both can put on a show. But even when someone is just one-two or boring-basic, I can make it fun and make work of it. Either way.